The word pochoir comes from the French poche - a cut-in, a pocket - and means "stencil". It refers to a print-making method in which stencils are used to manually colour a set of prints, with the number of stencils corresponding to the variety of the colours reproduced. This technique was peculiar in enabling every reproduction to retain a sense of the original. 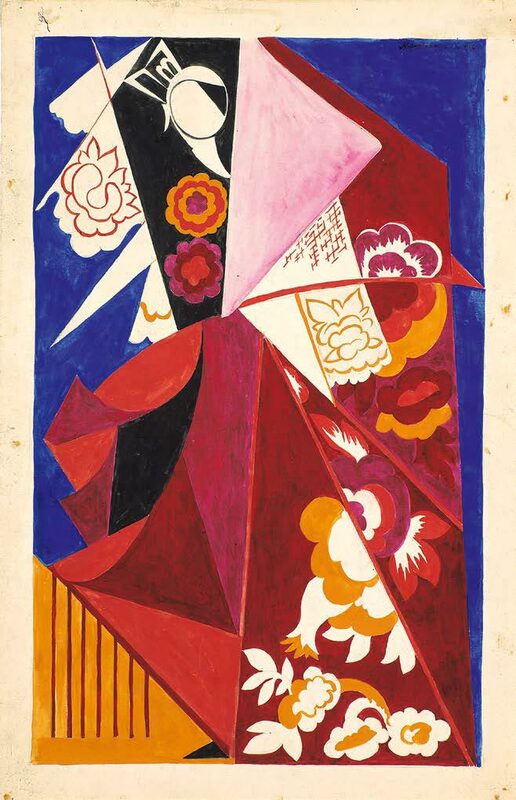 In the 1920s Natalia Goncharova used it in creating the "Portrait Theatral", "Spring" and "Liturgy" folios, as well as for illustrating Pushkin's"The Tale of Tsar Saltan" (1921), "La vie persane" (1921, Paris) by Edwin Evans (1921) and "The Tale of Igor's Campaign" (1923). Plans may have been made to produce more folios, since the exhibition includes a series of minor pochoir sets ("Still-lifes") and separate compositions - "A Girl with Autumn Landscape in the Background", and "Three Girls. A Walk". 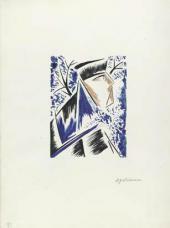 The Parisian artistic emigre circles went so far as to credit Goncharova with "inventing" pochoir which, of course, was not true: the same technique was used in France for rare editions with a small print-run. 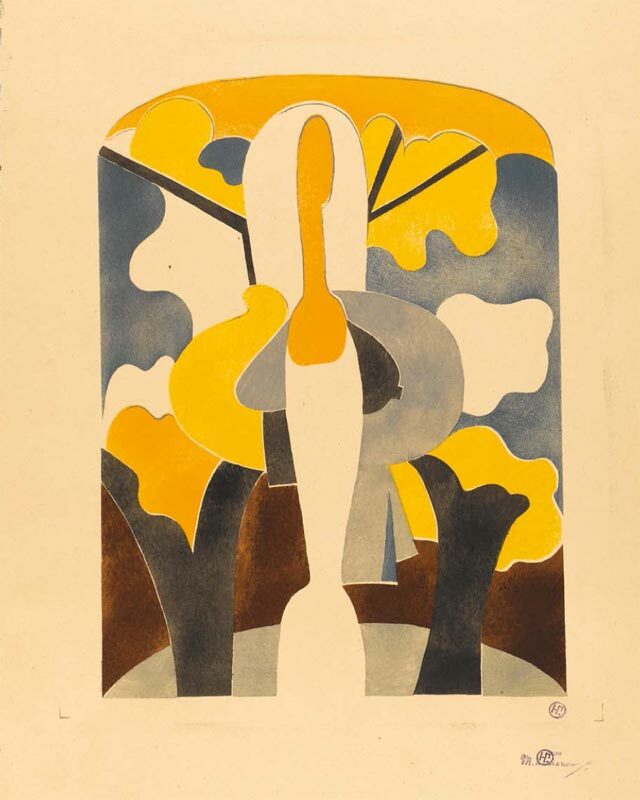 It became especially popular in the late-19th and early-20th centuries in connection with the phenomenon of the livre d'artiste, before Goncharova appeared. However, she had been familiar with the art of stenciling in her "Russian" years: in the early 1910s, together with Mikhail Larionov, she was absolutely absorbed in folk art in which stenciling was a common technique, used to colour the lubok (popular prints) and print fabrics. 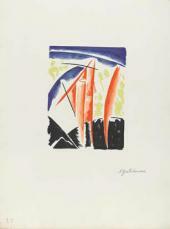 Stencils even appeared at the exhibition of popular prints organized by Mikhail Larionov in Moscow in 1913, based on his own collection (number 116-117, "A Sketch and a Stencil Plate")1. 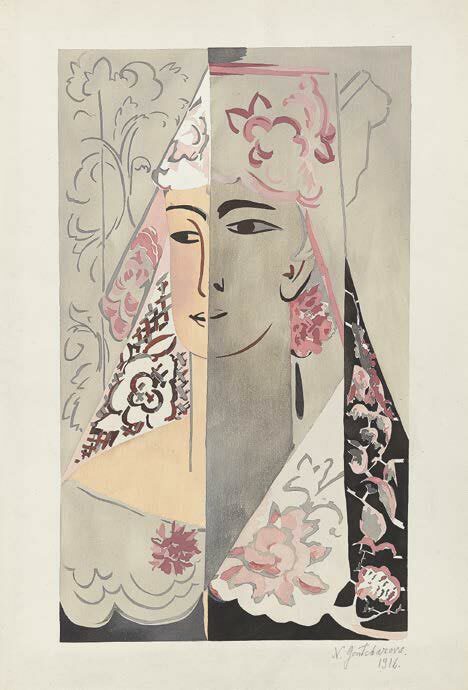 During the preparations for the Goncharova exhibition at the Tretyakov Gallery the questions arose of how did she come to use the technique of pochoir and when were her own first pochoirs produced? In 1919 the publishing house of Jaques Povolotzky2 "La Cible" produced a volume titled "M. Larionov. N. Gontcharova. LArt Decoratif Theatral Moderne". It included a number of pochoir pieces by Goncharova, such as "Costume Espagnole" (the sketch for which is in the current exhibition). The publication was timed for the similarly-titled exhibitions held at the galleries Savage (1918) and Barba-sange (1919), where it served as a catalogue. The introduction was dedicated to the work of the artists in the field of stage design. Pochoir (where gouache was applied) was an ideal way to reproduce draft colour drawings without corrupting the original pallete. 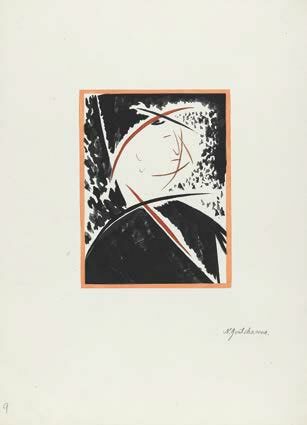 It is hard to tell whose idea it was to turn to pochoir - whether it came from Larionov and Goncharova remembering the "ancient" means of colour print-making, or from Povolotzky who was well versed in French publishing practices. The "improvised" pochoir plates made with several layers of oil paper in the Tretyakov Gallery collection are likely to have been assembled by the artists themselves. In a letter to Larionov of 12 November 1919 Povolotzky confirms as much: "I entreat you, Mikhail Fyodorovich, to arrange for the signing of the folios today or tomorrow - they are deteriorating... And you are still to add some pochoirs for the luxe! Please let us complete this folio as soon as possible without having to go back to it again. Regards from yours truly, Jaques Povolotzky. "3 The paper plates were too fragile to make a greater number of copies and subsequently had to be replaced by another material, as well as engaging a skilled craftsman for cutting the necessary stencils. 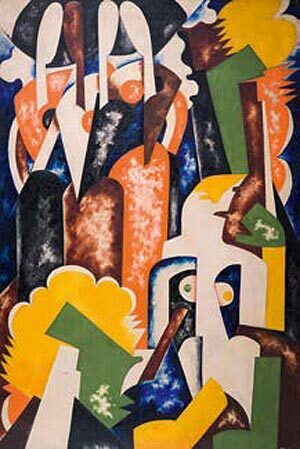 It was long assumed that Goncharova first attempted pochoir in 1915, the date attributed to the "Portrait Theatral" and "Liturgy". That dating by the author (indicated on the covers) appears somewhat puzzling: it was hard to imagine such portfolios printed in a considerable number of copies7 (and "Liturgy" was a large-scale edition) could have been accomplished in Lausanne (as the publishing details for both volumes suggest). At the time the artists were living in a hotel and busy preparing for Diaghilev's "Ballets Russes", working on stage designs, attending rehearsals and concerts. And why did the artist, in the middle of working on the stage production of "Liturgy" and sketching the costumes, need to reproduce them in a published folio? The same questions applied to the "Portrait Theatral", dated 1915-1916. One copy of that edition was supplied with a list of names suggesting that the portraits depicted the members of Diaghilev's "Ballets Russes" in the costumes of their characters. But some of the productions listed came later than 1915-1916: "Women in High Spirits" appeared in 1917, and "The Three-cornered Hat" in 1919. More documentation was needed in order to firmly establish or change the dating. We tried to follow the pochoirs through history of their exhibitions: as a rule the artists would have displayed their new pieces as soon as they were complete. In the graphics section listings of the exhibition at the Barbasange Gallery (1919) along with the stage designs, under numbers 181-190, there are "Portraits of Male and Female Dancers" (nine pieces whereas "Portrait Theatral" consisted of 14 pochoirs). There is no indication as to the technique used. 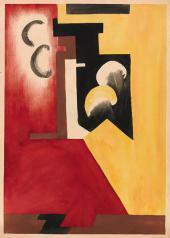 Among the compositions in a wide range of media, including paintings, stage designs and graphics, representing the work of both artists at "The Gontcharova-Larionov Exhibition" at New York's Kingore Gallery in 1922 six theatrical portraits8 are listed as watercolours, dated Madrid 1916, but the sizes do not match the pochoir volumes either. It is likely that in 1922 only the original watercolours depicting the actors existed. There were also a few watercolour landscapes on the list dated 1918. The landscape series apparently went back to the 1910s when Goncharova and Larionov spent more than half a year in the French countryside at an estate (or rather an agricultural commune) in Pivotan-par-Garchy growing vegetables. 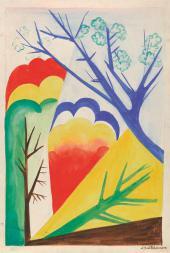 The 1924 list of Goncharova's work mentions the folio "Spring. 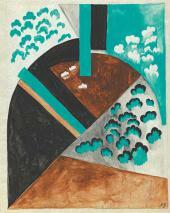 Constructivist Landscapes in Watercolour and Gouache" that were later reproduced as pochoirs. The Tretyakov Gallery collection preserves the zinc plates for that series, and examples of them are on display at the current exhibition, providing a unique opportunity to view the stencils, compare them with the impressions made from them, and follow the actual process by which a pochoir was created. All of the above suggests that a series of small-sized theatrical watercolour portraits (or pencil drawings for them) was likely commenced in 1915-1916. Initially it could have included the portraits not only of the ballet dancers but also of other individuals connected to theatre. 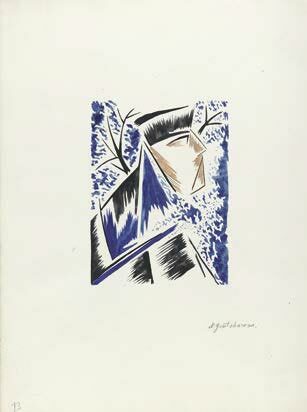 There is, for example, in a private collection, a "Portrait of Alexander Tairov", with whom Goncharova had worked in 1915 and whom she later met in her Parisian years when his Chamber Theatre was on tour there. Hence the dating"1915-1916" on the cover of "Portrait Theatral" portfolio referring to the beginning of the project. Whereas the actual pochoir folios were completed around 1926. Perhaps the impulse to draw the ballet dancers came when Goncharova returned to work for Diaghilev after a three year gap - the ballet "The Firebird", redesigned by her, was first performed at the Lyceum Theatre in London on 25 November 1926 . It was the same with the "Liturgy" portfolio. In 1915-1916 Diaghilev commissioned stage designs for the production from Gon-charova, who created multiple pencil drawings which she then coloured, applying gouache and using gold- and silver-leaf collage. When it turned out that the ballet was not going to be staged and the opportunity arose to obtain "professional" stencil plates made of metallic foil (zinc), the artist reproduced her compositions in the pochoir technique, slightly changing some of the pieces. 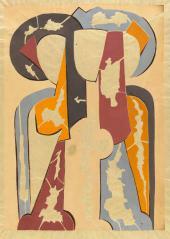 It was also in 1926 that pochoirs first appeared in an exhibition. Under number 45 in the catalogue of Goncharova's solo show at the Claridge gallery the text reads: "'Espagnole'. Pochoir, signed by the artist. 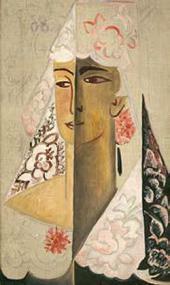 "11 This pochoir, copies of which are at the Tretyakov Gallery, is based on the painting "Head of a Spanish Woman" (1916). That the pochoir technique should be so needed can be explained by the absence of new commissions from Sergei Diaghilev whose Ballets Russes had for a long time been a regular source of income for Larionov and Goncharova. The Pochoirs were on sale, hence, apparently, the need to consider making additional copies. 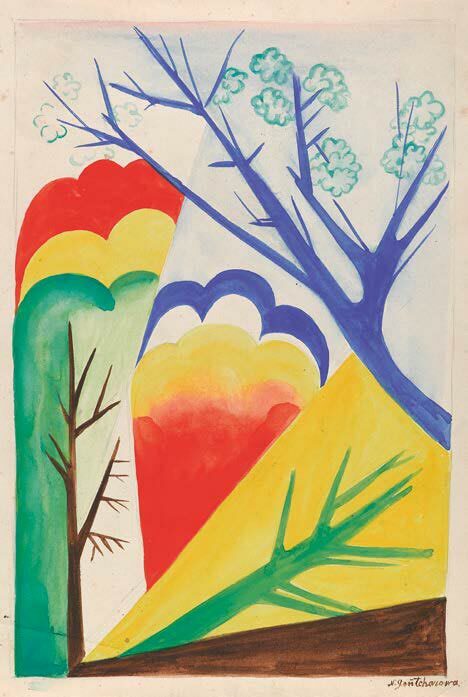 In 1926-1927 Goncharova became fully aware of how the pochoir technique was an ideal method of reproducing colour sketches, gouaches and paintings. 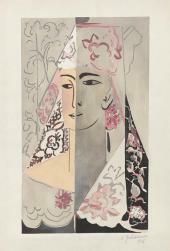 The paintings "Espagnole" ("Head of a Spanish Woman") and "Bouquet", known from a photograph in the artists' archive, were reproduced as pochoirs under the same titles. The "Bird" plate from the "Still-lifes" series of pochoirs can be traced directly to the small "Bird" painting. The story behind the reproductions of the larger compositions is even more engaging. Unable to produce large-scale prints and apparently unwilling at the same time to turn monumental panels into "coloured postcards" Goncharova decided to copy them in parts. In 1924 she had already tried experimenting that way with the "Bathers" (1922, Tretyakov Gallery) triptych, dividing it into parts and reproducing each in turn as posters for the "Bal des Artistes". A different "Bathers" panel (from the Sepherot Foundation) was also fragmented in the same way by the artist. One of those fragments was reproduced as a pochoir, "Three Girls. A Walk", which is part of the current exhibition. 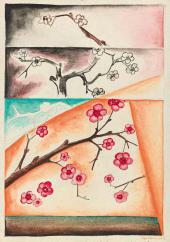 The book illustrations that utilized the pochoir technique as a certain tribute to the livre d'artiste tradition first introduced in Russia by Goncharova and Larionov remain beyond the scope of this article. There are sheets of fabric prints in a private collection which might have been intended as pochoir sketches, too. But research has made clear that, every time Goncharova turned to a new technique it provided an excuse for artistic experimentation and innovative creative practice. An exhibition of original icons and popular prints organized by Mikhail Larionov. Moscow, 1913. P. 17. Jaques Povolotzky (1881-1945) was the owner of this Russian publishing house in Paris, and an acquaintance of Larionov and Goncharova. Tretyakov Gallery, Department of Manuscripts, photo 180, archived unit 2527. Claude Autant-Lara (1901-2000), a French film director. Tretyakov Gallery, Department of Manuscripts, photo 180, archived unit 1258. Tretyakov Gallery, Department of Manuscripts, photo 180, archived unit 1260. Information as to the exact print-run is missing. In the quoted letter to Ivata concerning the"Liturgy" volume Larionov mentioned 50 copies. But there must have been more: the Tretyakov Gallery collection alone holds more than 100 sheets depicting Judas. Originals are part of the collection of the Centre national d'art et de culture Georg-es-Pompidou in Paris. Tretyakov Gallery, Department of Manuscripts, photo 180, archived unit 1114. Tretyakov Gallery, Department of Manuscripts, photo 180, archived unit 544. Exhibition of paintings by Natalia Goncharova at the Claridge Gallery. June 10-July 3 1926. Tretyakov Gallery, Department of Manuscripts, photo 180, archived unit 1702. Tretyakov Gallery, Department of Manuscripts, photo 180, archived unit 7438. Natalia Goncharova. A Girl with Autumn Landscape in the Background. Enrico Cecchetti (in the ballet “Women in High Spirits”), from the pochoir volume, “14 Portrait Theatral. 1915-1916”. Natalia Goncharova. Les arbres en fleurs (Pommiers en fleurs).